Portugal and German offered us the first chess match of the Euros. The three games up to this point had drifted a bit from what was widely expected - cagey contests with few goals. The Portuguese line-up had no surprises, with Hélder Postiga and João Pereira getting the nod ahead of Hugo Almeida and Miguel Lopes, but Germany manager Joachim Löw went with Mats Hummels instead of Per Mertesacker, most likely to in order to offer quicker defensive coverage for Ronaldo's charges. Portugal were happy to acknowledge Germany's superiority and played cautiously. Resisting the temptation to drop their lines too much, Paulo Bento's men had a clear game plan: to keep the ball from getting to their opponent's final third. 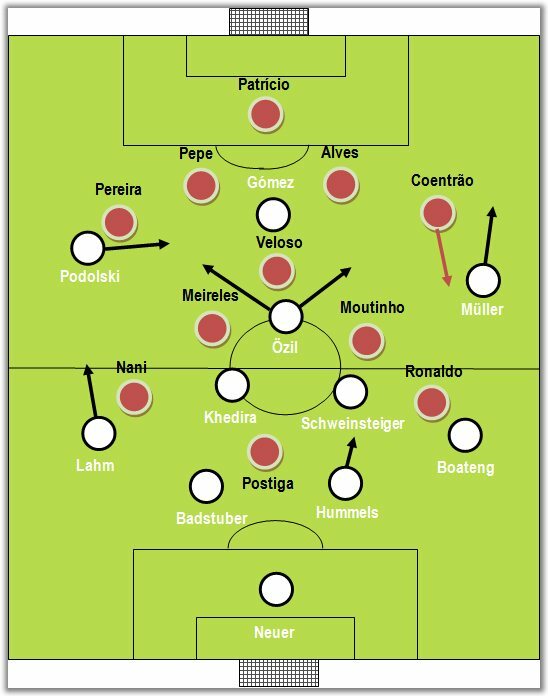 For that, they tried to stifle Germany's first build-up stage, with Moutinho and Meireles picking up Schweinsteiger and Khedira, respectively. However, the presence of Hummels meant that Germany were able to bypass that obstacle rather easily, especially because Hélder Postiga did not seem to know whom to mark. Hummels offered the Mannschaft better circulation of the ball. 20 minutes into the game, the Selecção kept finding it harder and harder to discover routes for their breakaways. Incapable of playing through the right, the main alternative lay with Fábio Coentrão's long passes towards Cristiano Ronaldo or Postiga, which seldom worked out. Furthermore, despite being vocal with their concerns about Ronaldo, Löw had clearly done his homework, as Miguel Veloso was always closely marked by either Özil or Gómez. This, in turn, meant that Portugal's routes were rather predictable and unsuccessful. Portugal kept trying to stifle Germany's midfield. With both teams seeming more afraid to lose than willing to win, the second half was not that different. Neither eleven was being able to do what they do best. Whilst Germany were more proactive, they still could not find space through the middle and started to look more for Gómez's aerial threat. 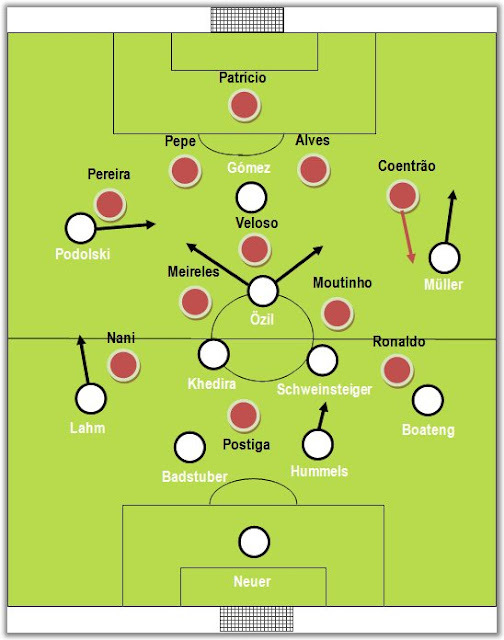 On the other hand, Portugal's transitions were not reaching their destination due to numerous wayward (simple) passes and out of sync movement. Löw tried to change that by asking Schweinsteiger to play higher up so that Özil could exploit the free space in front of the Portuguese defense. The strategy partially worked, with the German maestro easily overloading the wings (Ronaldo and Nani had clear instructions not to track back and provide the out-ball), but it did not deliver the end product. As for Portugal, without someone in the Rui Costa or Deco mould, it was hard to shake things up from midfield, with both wingers too static. A deadlock seemed to be in the cards up until the 72nd minute, when Mário Gómez proved that, while he lacks Klose's link-up play, he possesses a rare ability to transform a loose ball into a goal in a glimpse. From that moment on, Portugal had to chase the result and Bento threw Varela on the pitch for Meireles (Nélson Oliveira had already taken Postiga's position on the 69th minute) for one final push. After conceding the goal, the Selecção showed just how much more they have to offer when they are not just waiting for their opponent and, on the contrary, are willing to make use of all their strengths going forward. Even though the Portuguese players, coach and fans will most likely complain about bad luck and mention the two shots that hit the woodwork, the truth of it all is that Portugal can only blame themselves. While a team's organisation is paramount, that alone must not be their only game plan, if they want to achieve success. Bento will rally his troops by stating that Portugal had the better chances, but he would be better off asking his players not to shy away from what they do best.